March 10, 2014 By Allyson 111 Comments This post may contain affiliate links. Read my disclosure policy. Milky Way Caramel Cheesecake Brownies are stuffed with delicious creamy cheesecake and dripping with ooey gooey caramel! These will be a hit at your next party! My very favorite dessert in the whole entire world is cheesecake. Growing up I used to ask for cheesecake on my birthday in place of regular cake, and my parents usually agreed. I loved those cheesecake samplers that featured 3-4 different types of cheesecakes, and always my favorite one would be the chocolate or caramel flavors. Over the last few years I’ve become more comfortable baking ‘cheesecake’, and have made everything from Skinny Key Lime Cheesecake Cupcakes to Sopapilla Cheesecake which is a spin on Mexican cheesecake. I’ve never met a cheesecake I didn’t like, and I am happy to report, it’s not as difficult to make as I always thought. 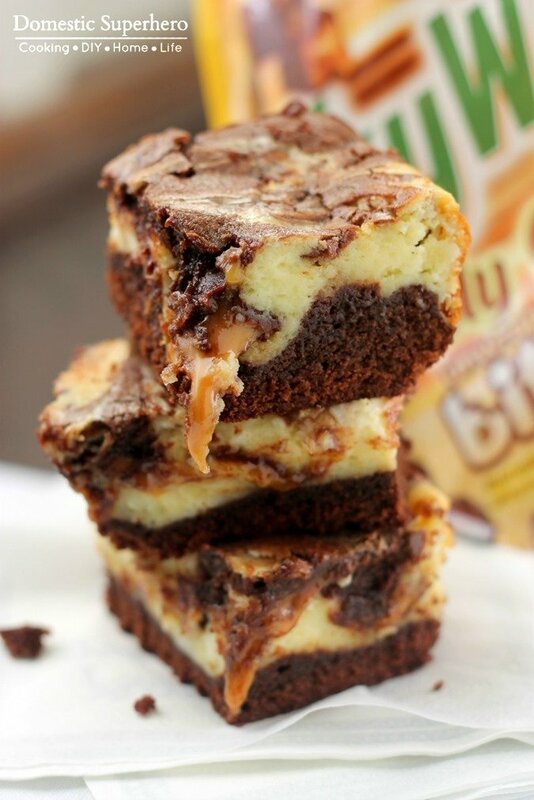 These Milky Way Caramel Cheesecake Brownies are perfect for every party or anytime really. When I heard Mars Brand Candy was coming out with some new ‘bites’ I was curious to see what they would be. Come to find out they have Milky Way Simply Caramel Bites, which is basically a caramel covered in chocolate….delicious. I knew these tasty little bites had major dessert baking potential and of course the first thing to make that came to mind was cheesecake. 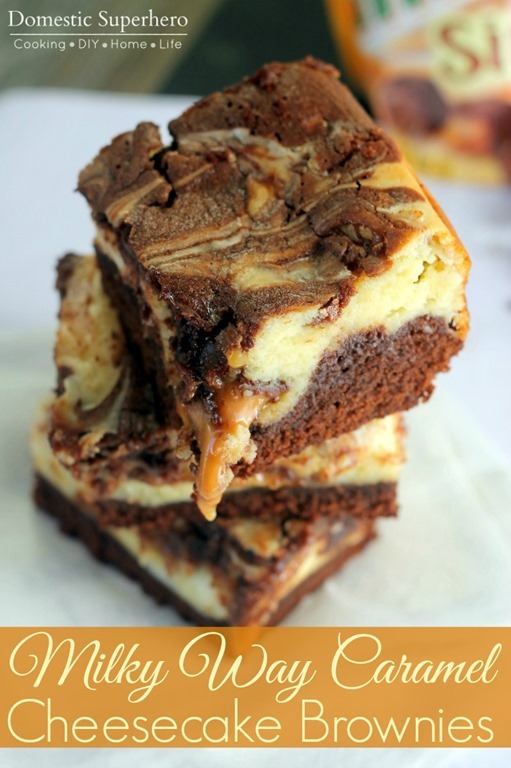 While making these Milky Way Caramel Cheesecake Brownies, I kept thinking of the delicious melted caramel and chocolate, and the soft brownie crust I opted to make instead of a plainer cheesecake. 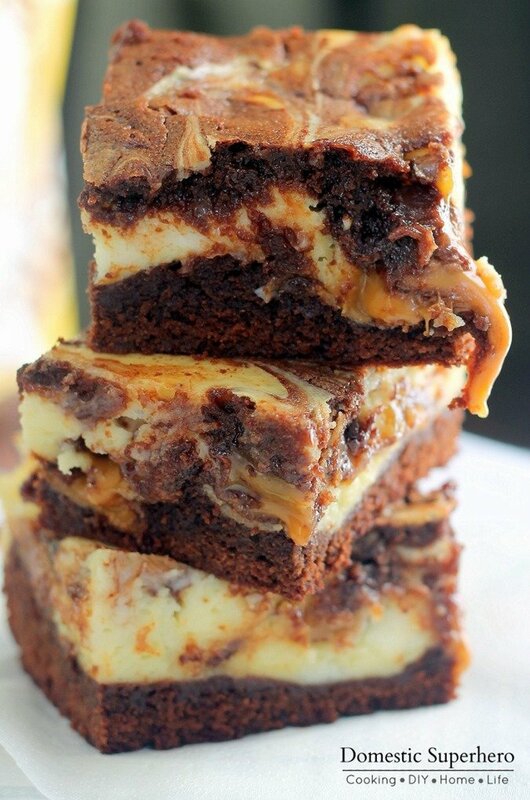 With a combo of chocolate, caramel, brownies, and cream cheese, how can you go wrong? You can’t. You need to make sure these bad boys cool completely before you slice into them. I also refrigerated the Milky Way Caramel Cheesecake Brownies before serving, but you could also serve them room temperature. You do have to refrigerate them after you are done serving though, because you don’t want the cheese filling sitting out for a long time. 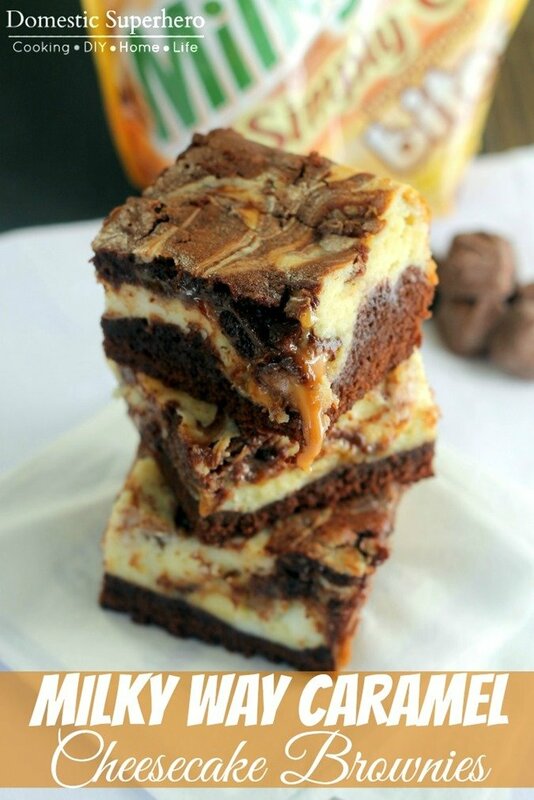 I’ve already unloaded a ton of these Milky Way Caramel Cheesecake Brownies to my friends and neighbors and everyone has raved about how delicious they are. These are seriously one of the best desserts I have ever made and it was so simple. Milky Way Cheesecake Brownies are stuffed with delicious creamy cheesecake and dripping with ooey gooey caramel! These will be a hit at your next party! *Preheat oven to 350 degrees F.
In a stand mixer or with a hand mixer combine melted butter with sugar and vanilla. Add eggs one at a time, beating well after each one. Add the cocoa and mix well. Then add the flour, baking powder and salt and mix until just combined, do not over mix. Set aside one cup of the brownie batter and smooth the rest into a foil lined 9×13 baking dish. With your stand mixer or hand mixer (cleaned off), begin making your cheesecake layer by beating cream cheese and sugar until smooth. Add the vanilla and then the eggs one at a time, beating well after each one. Pour the cream cheese mixture on top of the brownie mixture and using a spatula, smooth it evenly over the brownie batter. Sprinkle the chopped Milky Way Simple Caramel slices evenly over cream cheese layer. They should be close together and pretty much covering the cream cheese layer. Using the reserved cup of brownie batter, drop spoonfuls over the top of the candy bar layer, scattering around. Use your spatula or a butter knife to gently swirl the batters. This will combine the cream cheese layer and top brownies layer a bit, which covering the candies in batter. This does not need to be perfect. Bake at 350 for 35 minutes. Allow to cool completely before cutting into squares (at least an hour). After my brownies were done baking, I let cool for about 30 minutes, and then I was able to lift them all out of the baking dish with the foil (by grabbing the sides of the foil). This helped to cool more quickly. You can also set the baking dish on a wire rack to cool faster. Be sure to refrigerate the brownies when you are done serving. I like these best served cold so I allow them to cool for an hour on the counter, and then refrigerate another hour before serving. It's up to you! **Some people have noted that it took much longer for their brownies to cook. I would check them at the 35 minute mark, and then every 5 minutes after that if they don't seem done. I have made them several times and the 35 minutes is always perfect for mine, but people have noted it taking up to an hour for them. So just check them as they are cooking. Like Candy based desserts? Check these out…..
Oh I have to make these! There goes my diet but I can’t help it! These look too good! Both hubby and I LOVE caramel! I’m definitely making these! Yummy! Your pictures are making me hungry. I definitely will have to make these some time. OMFG YES PLEASE!! Those look so good. I’m drooling over here. Oh my, do these look decadent. Pinning for a special occasion! My sister would LOVE these! I am going to make them for her – YUM! oh my goodness. that looks so gooey and delicious! These look amazing! And I so will be making them! Thanks for sharing! This looks like it tastes super good. This looks really tasty! 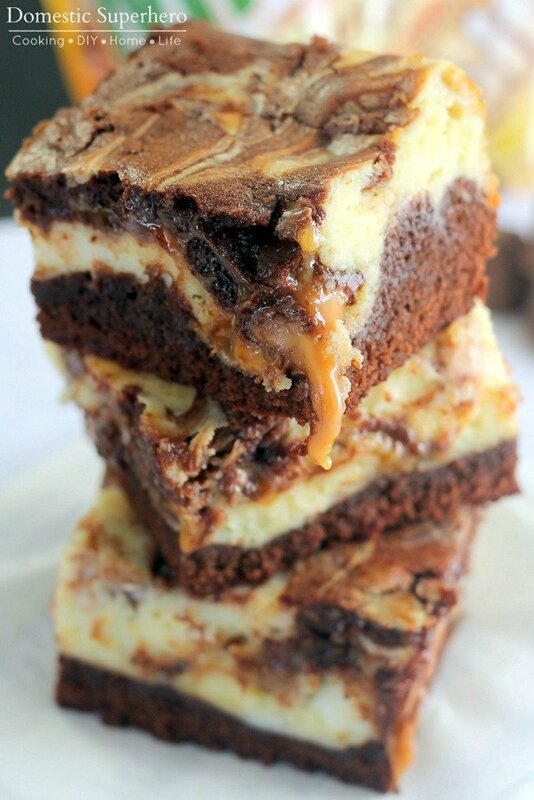 I love cheesecake and brownies so they’re the perfect combo, even better with caramel milky ways! Oh my goodness I seriously need some of this right now. I will be making this very soon. Oh this looks so amazing! Looks like it would melt in your mouth! These look AMAZING! I’m making them after Easter, because I gave up sweets for lent. This is my favorite milky way candy bars! Win-Win. Oh! Now I’ve got such a horrible sweet tooth! I am such a cheesecake and sweet anything fan! This looks really really really really good! Taking the recipe! I think I gained 5 pounds just looking at these. I want one. These look so good that even I want to eat them, and Im not even big on chocolate!! Yes God, please! You just blessed my life with this post. I am not even eating sweets or sugar, but I will make these just to be a blessing to someone else. I LOVE this! Amazing. You are killing me! Milky Way is my favorite candy! Must. Try. These! oh my goodness, that looks scrumptious! Nice sweet savory caramel – yummy! Wow Who Would Of Thought & I LOVE Milky Way!! Mmmmmm, these look so delicious. This just proves it, you can improve almost anything! 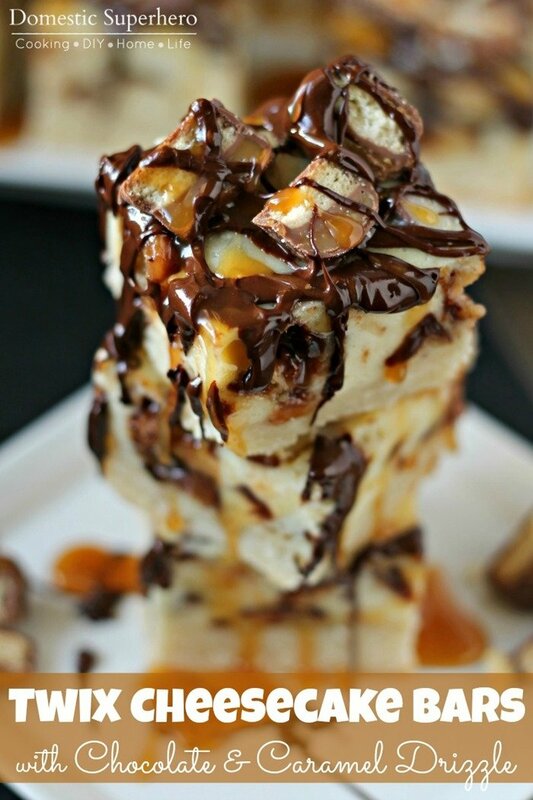 OhMYgosh that looks amazing – I’m so glad you shared this!! I HAVE TO try making this! I love Milky Way and these look fantastic! Only one thing came out of my mouth amazing and so tempting .I am seriously trying to loose weight. Oh wow. I think I gained 5 lbs just looking at the pictures. I’m afraid to make these…I’m pretty sure I’d eat the entire pan myself! Can’t wait to try these. I made these the other night, but since I’m gluten free, I used a boxed gluten free brownie mix instead of making the brownie from scratch and it turned out delicious! My only problem was not eating the milky way simply caramels up before I got to the part where i had to add them to the brownies! I am really happy to know that they turned out great using GF mix! I know a lot of my readers are GF, so this is definitely helpful! Thanks so much for sharing! Does the cheesecake part supposed to be wobbly still? Does that settle in fridge? It will firm up in the fridge, but should only be slightly wobbly, maybe in the middle. The rest should be pretty ‘set’ and not jiggling around! The bars were a huge hit at our neighborhood party yesterday. I accidentally bought the regular Milky Way bites instead of the caramel bites and they worked just fine in this recipe although not as caramelly I’m sure. Try this recipe you will not be disappointed!! Yay! I am so happy y’all like them! I really think you can exchange any chocolate candy it they will be just as tasty! I Have some them with Twix and Snickers bites and they are SO good! I’m still fairly new at baking if someone could reply asap because I’m actually going to be baking these in a week my question is the brownie mix from a brownie box and is it the dry mix or do we follow the brownie mix and then add it to the recipe? Hi – I am confused by your question…do you want to use boxed brownies in place of the homemade brownies in the recipe? If you use box brownies, then follow the directions on the box of brownies and OMIT the ‘brownie layer’ ingredients in the directions. You will make the cheesecake layer and then follow the directions from there. You might need 2 boxes of brownies to make these though, because I think the homemade recipe yields a larger serving of brownies. Or, you could use one box and then use a smaller baking dish. where is the recipe? can’t find it!!!! I just took these out of the oven,cannot wait for them to cool,they smell delicious !!!! I hope you enjoy them!! OMG I have died and went to milky way heaven! These look amazing and I cannot wait to try them! If you ever need a new link up party..stop by my blog 🙂 I would love to have you and your awesome recipes! Oh no, Nancy! I am not sure what happened 🙁 You cook it all together, so I probably would have just advised to cook a little bit longer. Where wasn’t it cooked through? The bottom layer? I had the same problem. Mine weren’t even close to being done at 35 minutes. I had to cook them for over an hour. Thanks for letting me know. I have made a note in the instructions in case anyone else runs into the same issue. Hope you enjoyed them! You’ve combined all my favourite ingredients into one dessert bar here! Pinning! OMG thank you for coming over and linking these gems up! Between this and the cheesecake twix I am in heaven lol! I cannot wait to try these, the ingreds will be in my shopping cart on my next trip to the store! My hubby who doesnt even like sweets cant wait to try it! Pinned and pinned! Party starts tonight at 10, hope you make it back to share more goodies with us! You’re welcome! I hope you try them out – they are delicious! I have boxed brownie mix on hand could I use that instead of making the brownie by scratch and then just follow the rest of the instructions ? I think that would work out fine! Let me know how they turn out, but I am 99% sure it should be great! I also had to cook them longer than the 35 minutes. I guess it just depends on how fast your oven cooks food! Cant wait to eat them! the house smells great! I am going to make a note about this in the directions! I think my oven may be hotter than normal, it kind of annoys me! How did they turn out? What size pan did you use? Are you saying 2 16oz. bars of cream cheese or 2 8oz. bars? It is 2 Eight Ounce packages of cream cheese as stated! Enjoy! what a creative idea! 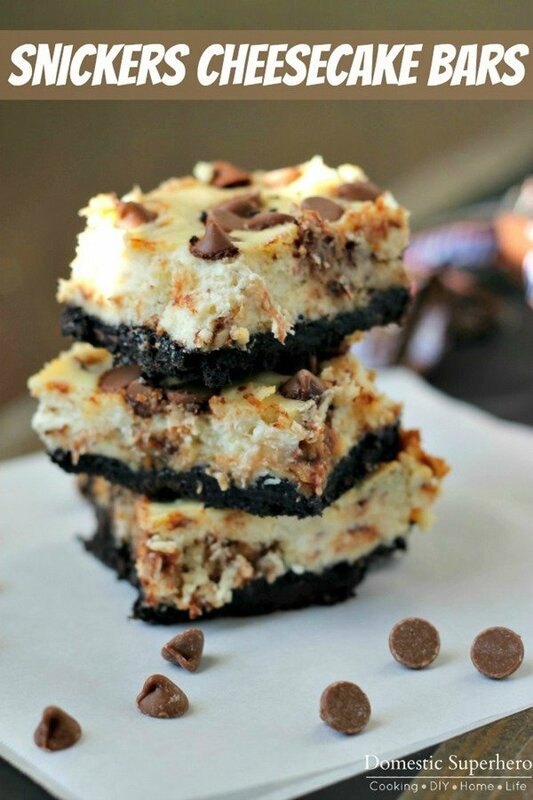 all of your cheesecake bars also look amazing! This looks amazing, but where is the actual recipe. I know I must be overlooking it. So weird, thank you for calling this to my attention. The thing I use for recipes to display is down I guess. I have put the recipe into the post, so you should see it now. Thanks! 1. In a stand mixer or with a hand mixer combine melted butter with sugar and vanilla. Add eggs one at a time, beating well after each one. Add the cocoa and mix well. Then add the flour, baking powder and salt and mix until just combined, do not over mix. 2. 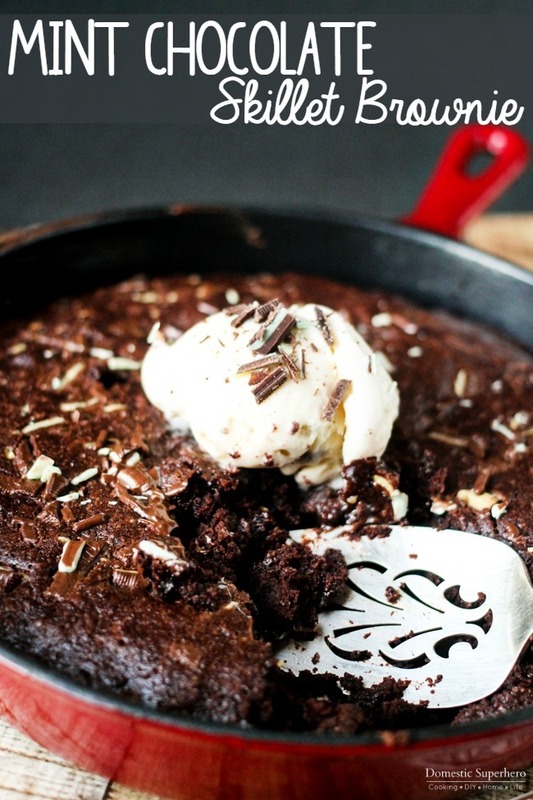 Set aside one cup of the brownie batter and smooth the rest into a foil lined 9×13 baking dish. 3. With your stand mixer or hand mixer (cleaned off), begin making your cheesecake layer by beating cream cheese and sugar until smooth. 4. Add the vanilla and then the eggs one at a time, beating well after each one. 5. Pour the cream cheese mixture on top of the brownie mixture and using a spatula, smooth it evenly over the brownie batter. 6. Sprinkle the chopped Milky Way Simple Caramel slices evenly over cream cheese layer. They should be close together and pretty much covering the cream cheese layer. 7. Using the reserved cup of brownie batter, drop spoonfuls over the top of the candy bar layer, scattering around. 8. Use your spatula or a butter knife to gently swirl the batters. This will combine the cream cheese layer and top brownies layer a bit, which covering the candies in batter. This does not need to be perfect. 9. Bake at 350 for 35 minutes. Allow to cool completely before cutting into squares (at least an hour). I like these best served cold so I allow them to cool for an hour on the counter, and then refrigerate another hour before serving. It’s up to you! **Some people have noted that it took much longer for their brownies to cook. I would check them at the 35 minute mark, and then every 5 minutes after that if they don’t seem done. I have made them several times and the 35 minutes is always perfect for mine, but people have noted it taking up to an hour for them. So just check them as they are cooking. Your comment put a HUGE smile on my face on a day that was not going so well – THANK YOU! These Brownies are seroiusly THE BEST EVER and that is an amazing price your husband found (love that clearance section)!!! 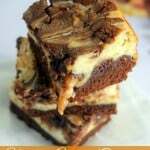 I have a couple other candy brownie recipes too, check them out! And if you like ‘real food’ I have tons of recipes for that too. Thank you for stopping by and thank you for leaving your sweet comment! I made these last night, and though they were good, I prefer a fudgier, gooier brownie. The recipe was too cakey. If I were to make it again, I’d use fewer eggs to get the consistency that we prefer right. It was a fun experiment! HI I found your recipe on Pinterest. I am doing a Round Up blog post later in March for National Chocolate Caramel Day (the 19th) and am interested in including this recipe in that round up. I would like to use a picture from the post, with links back to your site/this post. I would promote it on my all my social media platforms and would share the link with you so that you could do the same if you wish. If you are not interested, I understand, I will not use your post/images without your permission. That is totally fine! Thanks for asking and I can’t wait to see it! These brownies are AhhhhhhMazing!!!! I added pecans to the caramel bites layer…yum, yum, yum and I served with vanilla ice cream….absolutely heavenly!!! I also cooked them for just under an hour in a 9×13 pan. They were such a hit with the teenagers hanging out at my house last night that I decided to make a another batch for a church get together tonight. What a hit!!! Will definitely make these again and again. Thank you for helping me score some major brownie points with this recipe…..Hahahaha!! 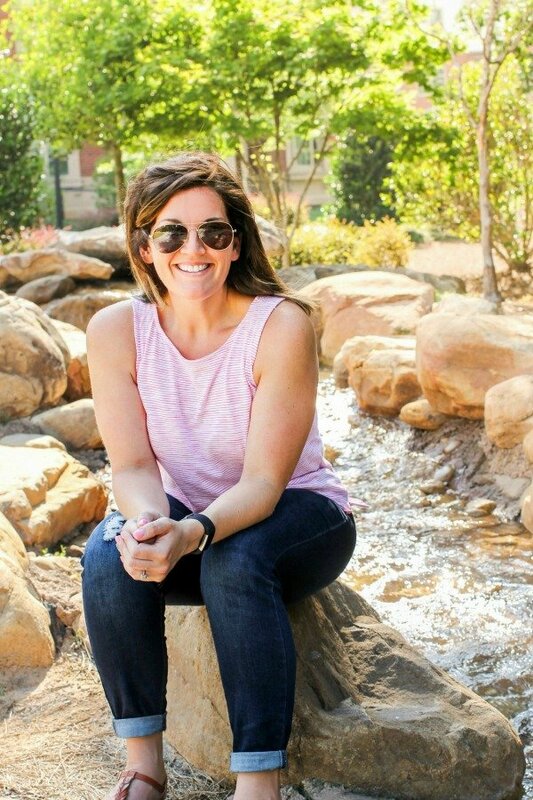 Dang girl, those sound like awesome additions! I will have to try that. I am so happy you liked them, they are really our go to brownies too…for everything…’oh, you hurt your toe? BROWNIES!’ LOL! Thanks for coming by to let me know! Yay! So happy you loved them! I wish I was having them this weekend – yum! Could you add some info about how you tell that they’re done? I baked mine for 55 minutes – at that point, a knife came out with just some cheesecake and caramel on it so I thought they must finally be done. But then I cut into them after they cooled and they were definitely still on the underdone side. They held together but were still kind of wet. I was far too lazy to cut up a bunch of Milky Way pieces so I just used some Kraft Caramel Bites that I had on hand. (They’re unwrapped caramel balls, typically found near the chocolate chips.) I only wish I’d had a full bag! But they were still tasty. It doesn’t matter much, but I typically use unsalted! This is a marriage made in heaven. I love cheesecake, brownies, and Milky Way! YUM!!! I tried making these yesterday and was slightly disappointed as my cheesecake layer settled on the bottom as it was cooking. Not sure what caused it to do so because I followed the recipe exactly except I used regular milky way in stead of the simply caramel milky ways. However they still tasted delicious even though the cheesecake was the bottom and brownie on top. Oh wow! Well, it still sounds delicious and it sounds like it tasted delicious too! I haven’t run into that issue, but could have just been the way it was mixed/spread/etc. Glad you liked the brownies!